Based on the above, you’d be surprised to know that Fall is my favorite season. The season for adventure and beauty in my corner of the country. It’s a time when we wind through roped-off sections of orchards pretending to be foragers. It’s a time for climbing, and cooking, and running, and breathing; there’s this great feeling of purity and cleanness as the air changes to crisp. And I treat it like it’s my new year; I make all of my resolutions in the fall. I always feel dirty in my inadequacy next to the cool wind’s inherent cleanness. I wash and I repair, and I move on. The question, then, is why am I trying so hard to push off what’s already come this year? I’d love to say something eloquent, but I don’t know. I have a fear, an uneasiness, a gut feeling that fall just should not come. And it’s not the fear of impending winter (as much as I hate that season post-holidays). Though I have done my share of sitting around, wasting hours trying to figure out what’s wrong while eating all of the tomatoes (they’re still delicious) I can, I finally found the urge to bake with those fall apples that I feel like I was castigating just yesterday. But I’d start by treading lightly. I’d highlight the season’s apples’ more delicate side, playing on their crisp flesh and bright, honeyed juice. I’d bring out the summer in them. I love fall desserts but find their scope to be narrow. I do believe that every season has a taste. Close your eyes, breath in summer, and you’ll smell honey (that’s the nectar of juicy fruits) and taste clean cucumber on your tongue. Take a whiff of winter. What do you get? I get ginger and tea, the savory smell of roasted meats, and the sweet vegetal scent of sautéed aromatics. Fall rolls in with the tart-sweet first apples and then the cinnamon-spiked everything. But before I curl myself around that mug of warm cider or burn my fingers on my first cooked fruit–filled pie, I needed to warm up to fall’s ingredients. Because figs and grapes and apples have flavors on their own. I like the spice, but I don’t want to smother them. I want to warm up to those flavors. Yes, I need to tread lightly. 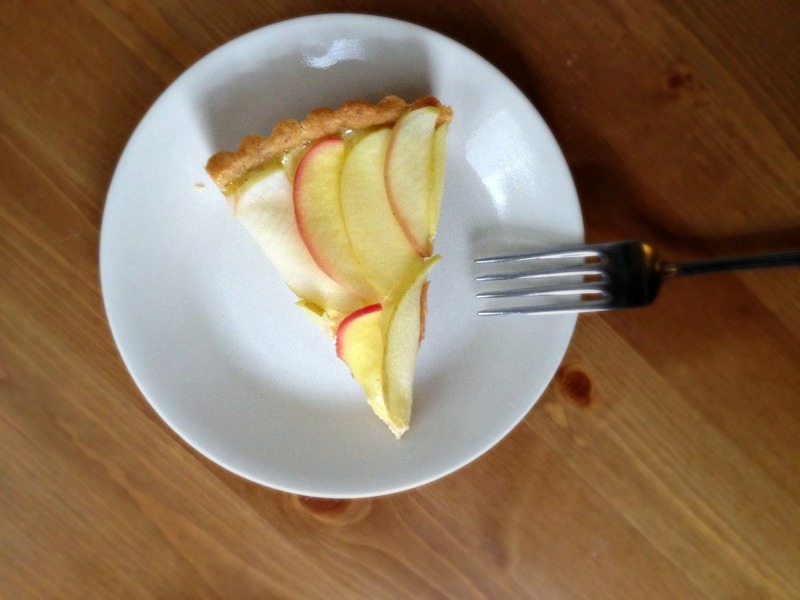 This tart was a brilliant introduction that didn’t take me too far out of my summer comfort zone. Inside that almond-enhanced sweet tart shell is a simple vanilla bean custard (fun fact: custard of any kind is the ultimate comfort food to me). It bakes. It cools. And it’s topped with a bouquet of apples. But they’re not sautéed in butter or cloaked in the contents of the spice cabinet. Mandoline-cut slices are poached—ligthly poached so that they retain some bite in liquid spiked with just enough rosewater to bring out the apples’ floral notes, but not so much to make the slices taste like your grandmother’s eau de parfum. Despite my Persian background, too much rosewater gives me a trippy headache. A little can be magical. The combination may seem exotic—like some poor attempt at a Middle-Eastern-French fusion dessert. But rosewater-scented apple pie is a thing—a very American thing that dates back to the Colonial period. And it’s a very good thing too. The crisp-tender cooked apples are cushioned by that luscious custard and complemented by the almond flavor of the crust. And the petal formation on top is as light and fresh as the pink flowers of summer that paint one of my favorite silk dresses. There can still be roses in October. And what’s better than an edible rose? For the tart: Adjust oven rack to middle position and heat oven to 350 degrees. Bring cream, 2 tablespoons milk, sugar, vanilla bean pod and seeds, and salt just to boil in small saucepan over medium heat, whisking to dissolve sugar. Remove from heat, cover, and let infuse for at least 30 minutes or up to 1 hour. Meanwhile, gently whisk eggs together in bowl until combined, trying to incorporate as little air as possible. Whisk milk and cornstarch together in bowl. 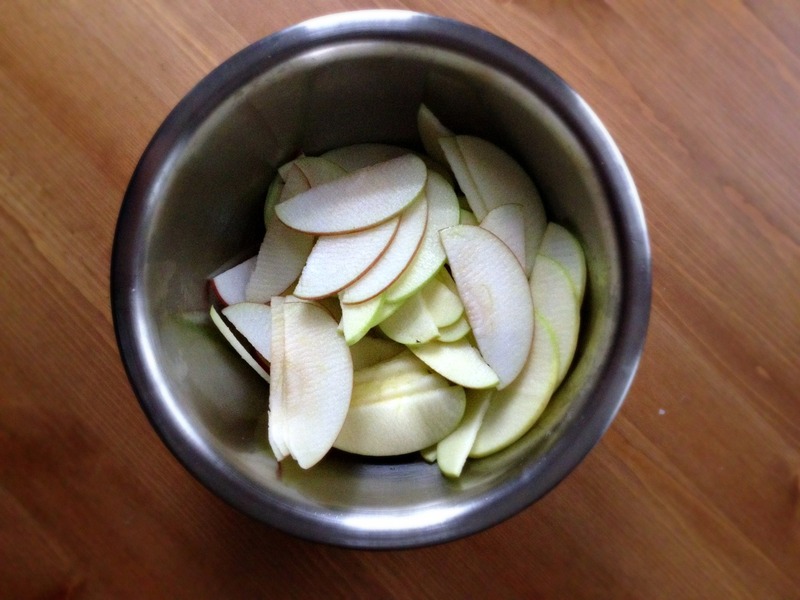 For the apple topping: Cut a round of parchment to fit inside large saucepan and cut 11/2-inch whole in center of circle. Bring water, sugar, rosewater, and lemon juice to simmer in saucepan over medium heat, stirring occasionally to dissolve sugar. Add apples, cover with parchment round, reduce heat to medium-low, and simmer until apples are crisp-tender (slices should be just starting to turn translucent around edges and be able to be bended in half completely without breaking), stirring occasionally, about 5 minutes. Drain apple slices and lay on paper towels. Cover with more paper towels and let dry. Discard all but 2 cups poaching liquid. Bring to boil over medium-high heat and reduce to thick, glazelike consistency. 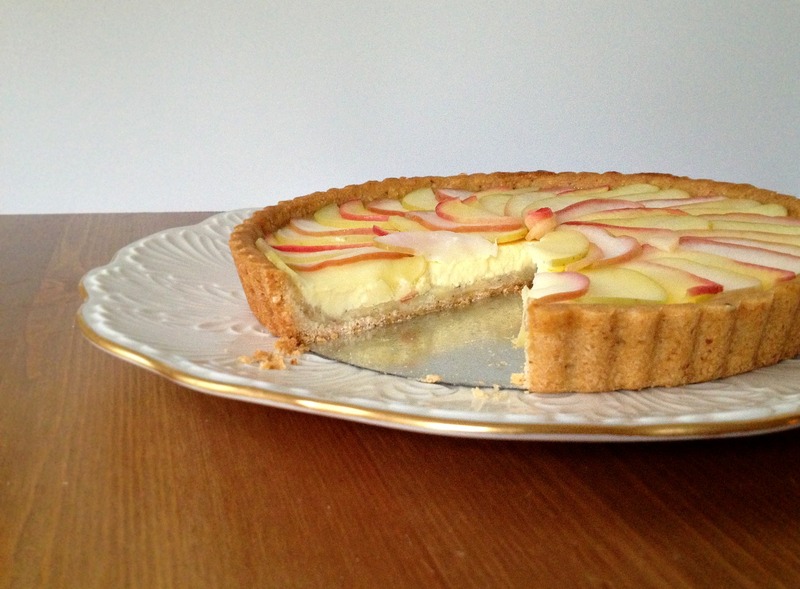 Starting from edge of tart, place apples, overlapping, on top of cooled custard in flower pattern. For the center, roll an apple slice to fit in space. Brush apples with reduced poaching liquid, if desired. Serve or transfer to refrigerator before serving. You are absolutely right…..rose scented foods, as long as they are not overdone, are lovely. 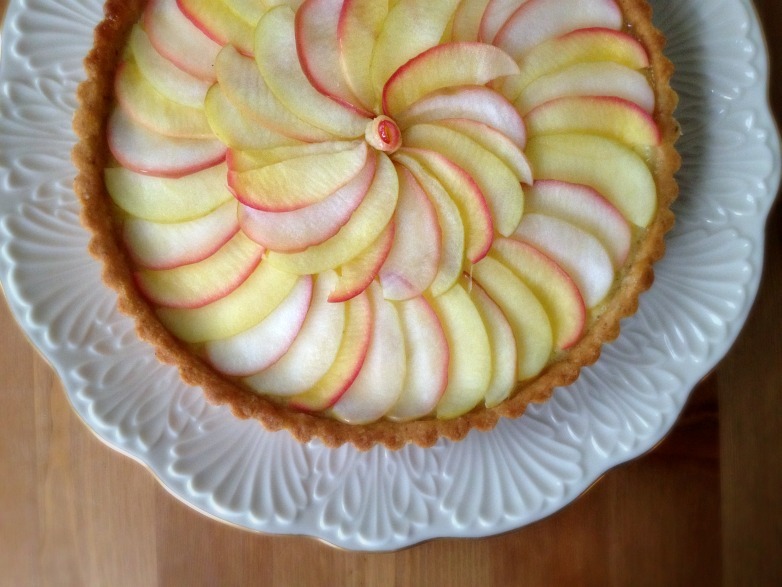 This tart looks gorgeous. October Flowers is such an exquisite title. But I believe I like the exceptional Apple Tart even more! An enchanting fall post! I am quite the fan of rose scented desserts, and this looks so lovely! I love your blog, Natasha, and I’ve read it for quite some time. Thanks for stopping by! I love fall, but it is awfully confusing still having good tomatoes to eat. I’ll admit that I don’t usually go beyond apple pie and apple crisp when it comes to fall desserts, but this has me very intrigued! 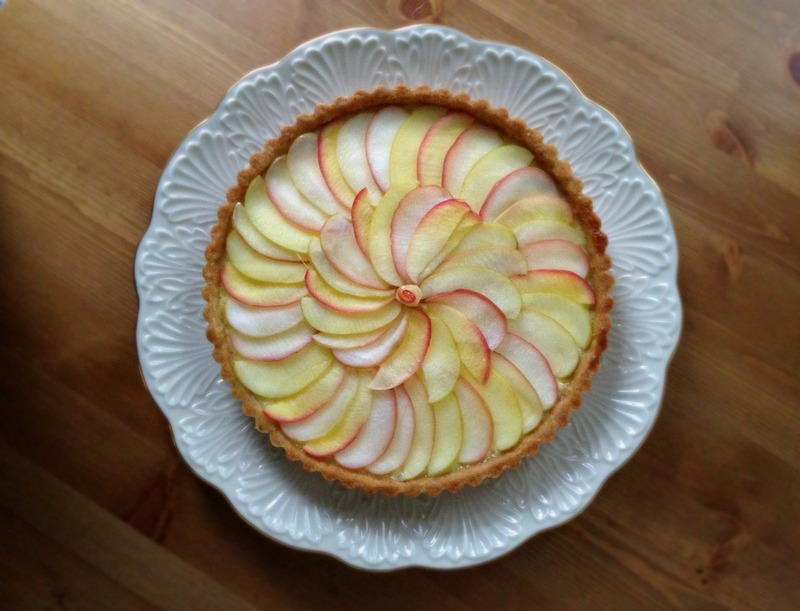 What a perfectly gorgeous tart. I do love autumn—who couldn’t love all those wonderful apples? But I hate all the stuff that everybody else seems to like about the season. Pumpkin spice lattes? Ugh. And then there’s the fast approach of horrible winter thing. Double ugh. I keep meaning to try rosewater in something. This seems just the reason to! this looks so elegant, and i’m intrigued by the pairing with rose! i have yet to bake with any apples… hopefully this week i will find time? 66 grams (about 1/3 cup) what ingredient goes wt. this? Hi, Doris. I’m so sorry for the omission! That should be sugar (granulated). I will correct the recipe right now!